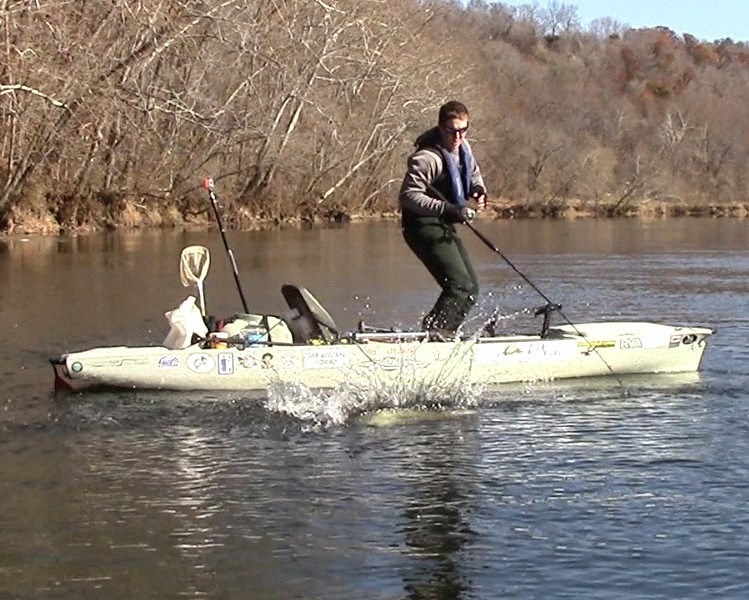 As the weather cools here in Virginia, Grant and I look forward to the unique opportunities that occur with cold water. With the temperature dropping steadily most fish migrate toward deeper pools to wait out the winter. 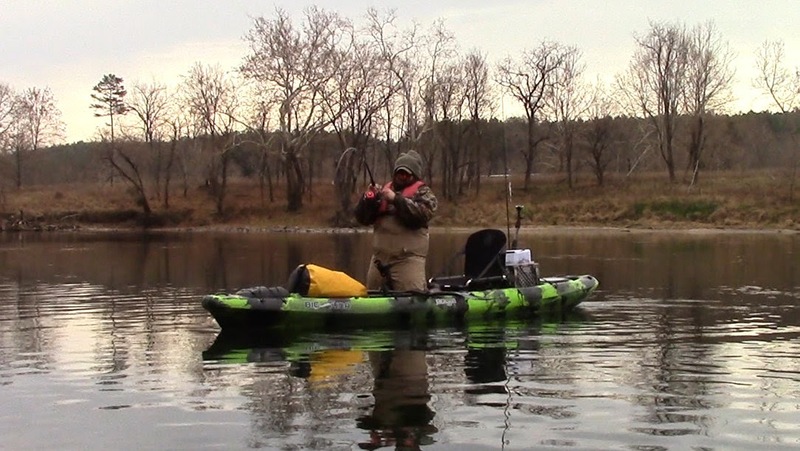 While most anglers hang up the rods for the year and wait for warmer days, we however do not. Braving frigid mornings and dealing with frozen rod guides is just the price you have to pay for capitalizing on these concentrated fish patterns. The Blue Ridge Mountains are where we like to stomp around in winter. 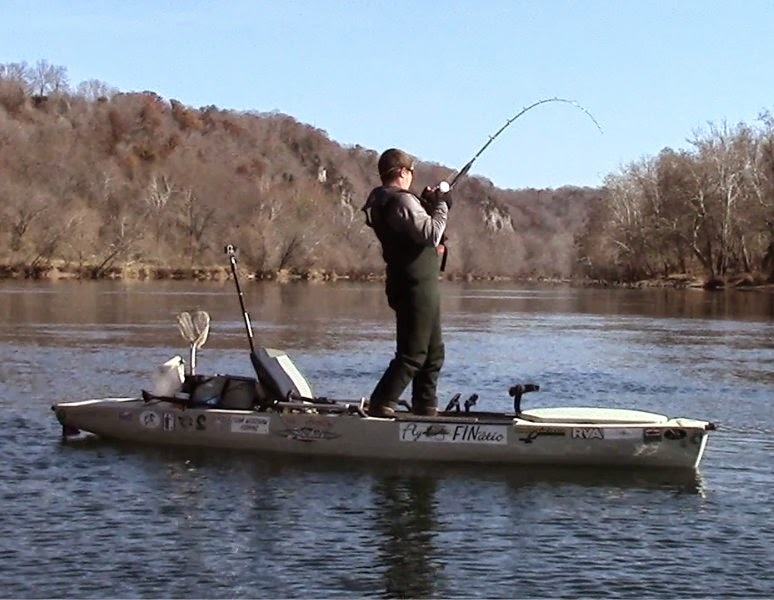 Although the weather is always colder and the winds more bitter than anywhere else in Virginia; Appalachia is the perfect place to chase fish through the colder months. 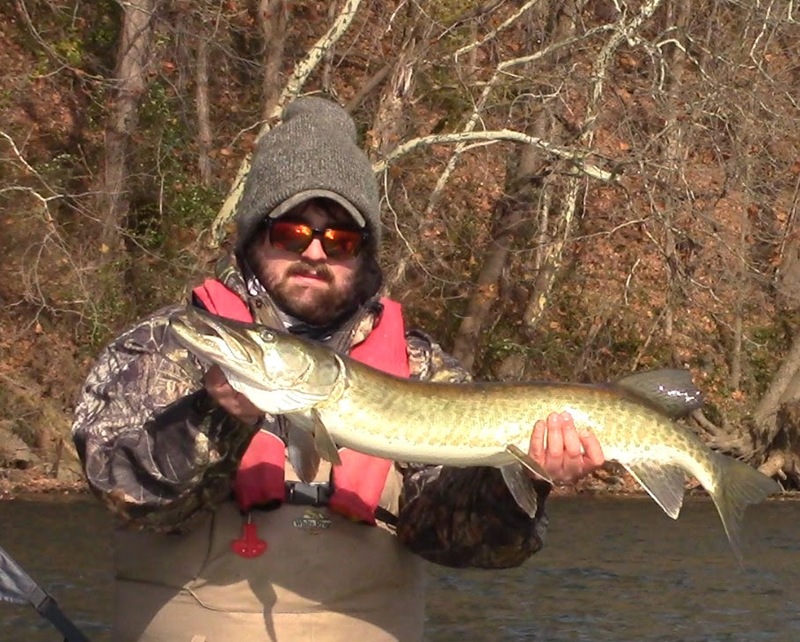 The reasoning is simple; the mountains stay cooler longer throughout the year allowing for more cool water species such as Muskie, Trout, and Yellow Perch to thrive. Where most warm-water species become sluggish and difficult, often times these cool-water fish heat up as the temps drop. Day number one was as cold and frigid as it was entertaining. We started the day out with temps in the mid-teens and 5-10mph winds that spit a good deal of snow on us for most of the day. 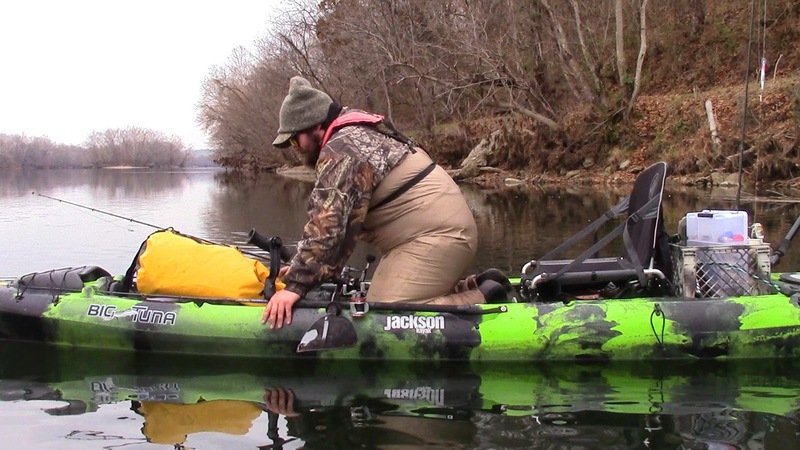 Though it was difficult to leave the comfort and warmth of the truck, the mythical lure that the toothy beasts possess is simply too much to ignore and we hit the water. As if the weather wasn’t enough to burn this day into our memory it quickly got more interesting the farther we moved up the river. No more than 200 yards from the ramp we managed to see two stellar Whitetail bucks, one of which I’m certain would have been Boone and Crockett class, and if that wasn’t cool enough we we’re suddenly subject to the roar of an Air Force fighter jet as it shot directly over us what seemed like mere feet before it disappeared straight up into the clouds that came from. 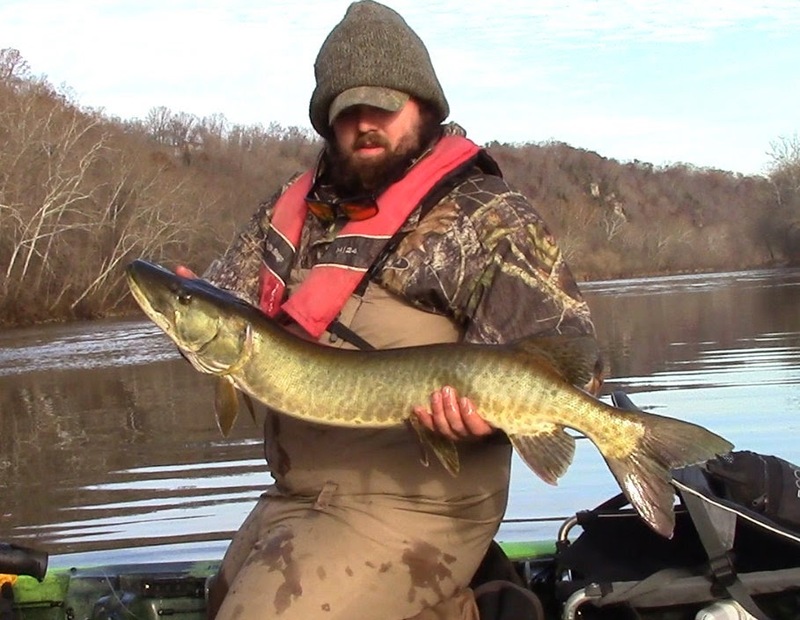 Anyhow, enough with the longwinded storytelling, we quickly began seeing our subjects in the clear New River water and before we knew it I was hooked up on a good sized Muskie. After t-boning my Savage Gear line thru swimbait she put up a brief fight and was in and out of a photo-shoot before she knew what hit her. 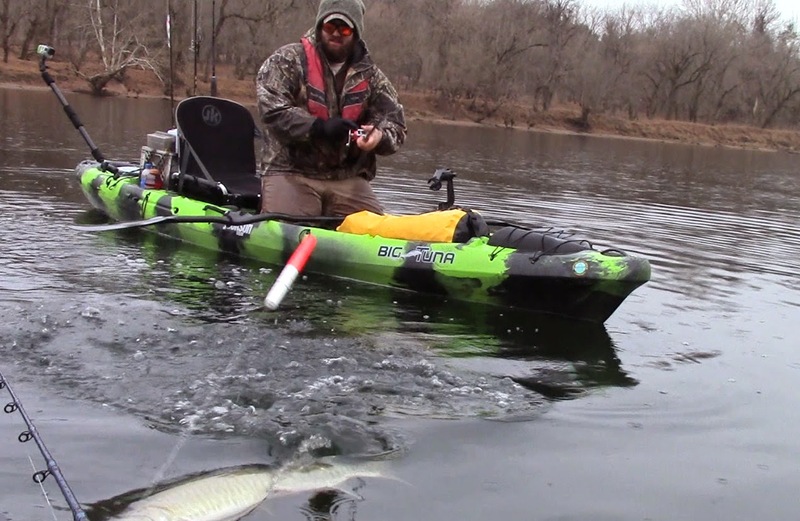 The weather on the first day made fishing difficult and other than Grant having a fish come unbuttoned on the way back to the ramp, that’s all the Muskie action we had for the first day. Days two and three were completely different ballgames all together. 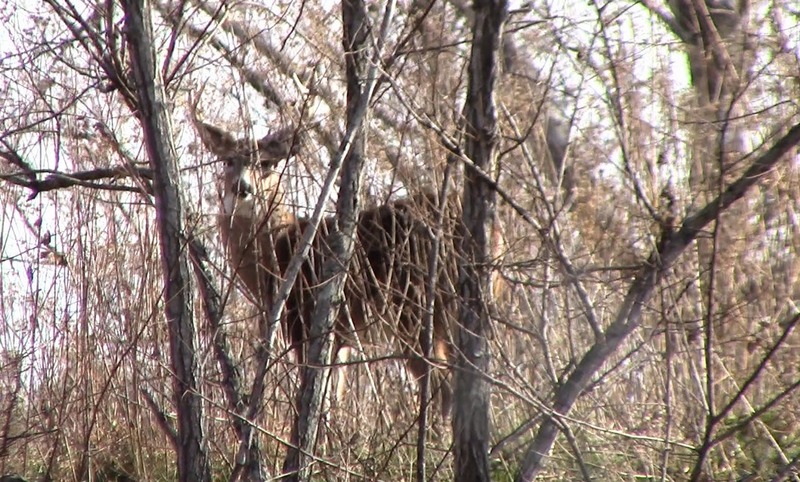 On the second day we were met with clear skies and temps in the 40s, little to no wind. The resulted in perfect conditions to spot the fish we were chasing, and that we did. Where we only saw 7 fish all day the first day, this time up the river we saw 7 within the first few hundred yards. 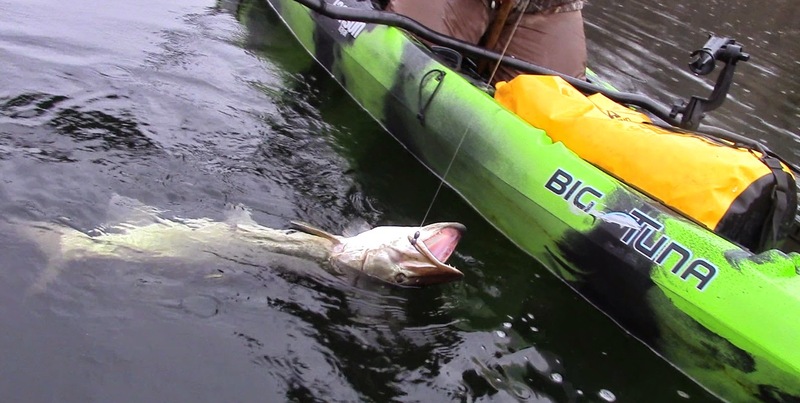 For those of you who are aspiring kayak Muskie fishermen seeing these fish can be just as exciting as hooking into one, it’s an adrenaline rush unlike any other in the freshwater field. Like I stated previously, chasing these fish is always a challenge, however, we aided our efforts this go around by adding some live bait to the mix. Absent on day one, dropping live fish down to the depths for these predators almost always puts the advantage in your favor. 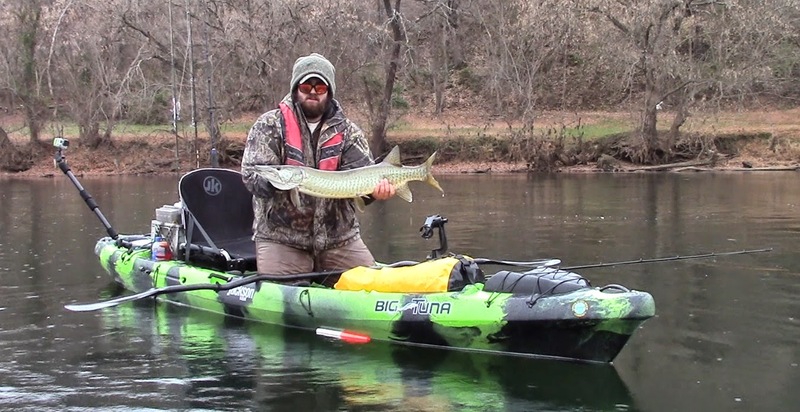 It wasn’t long until Grant stuck one under the boat and after a few stunning aerial displays he had the ‘Ski subdued. 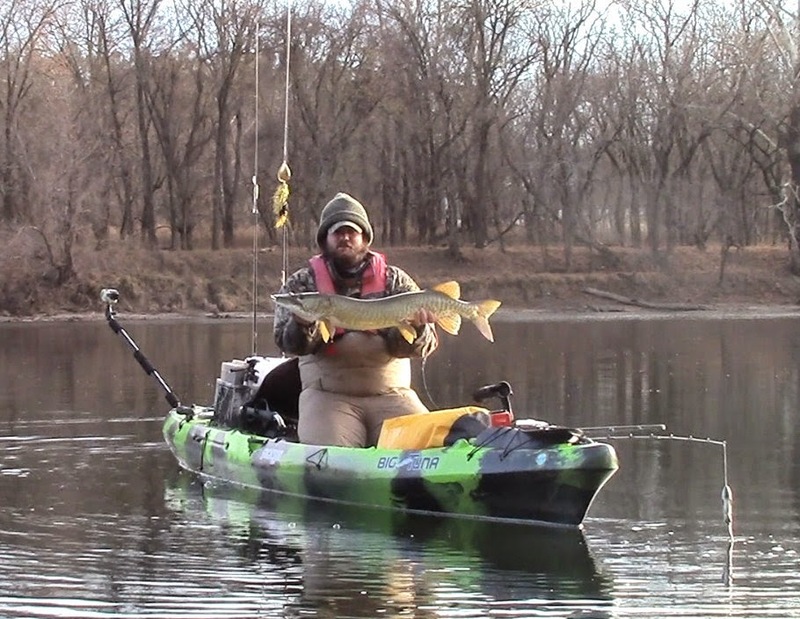 It wasn’t long before I followed suit and landed a fish out of the same stretch of water, almost identical in length at about 37-38 inches one could swear it was the same fish if he so did please. Our final day on the New was a heartbreaking one. Not only were we leaving this angling paradise for who knows how long….. it managed to keep a piece of my sanity there with it. The day started out wet and rainy, overcast, not great for seeing the fish but overall good conditions for clear water Muskie hunting. We were pleased with how the trip had gone up until this point. We had our brand new cameras along, filming all of the catches with pleasing detail for our upcoming series of episodes to be released in 2015. 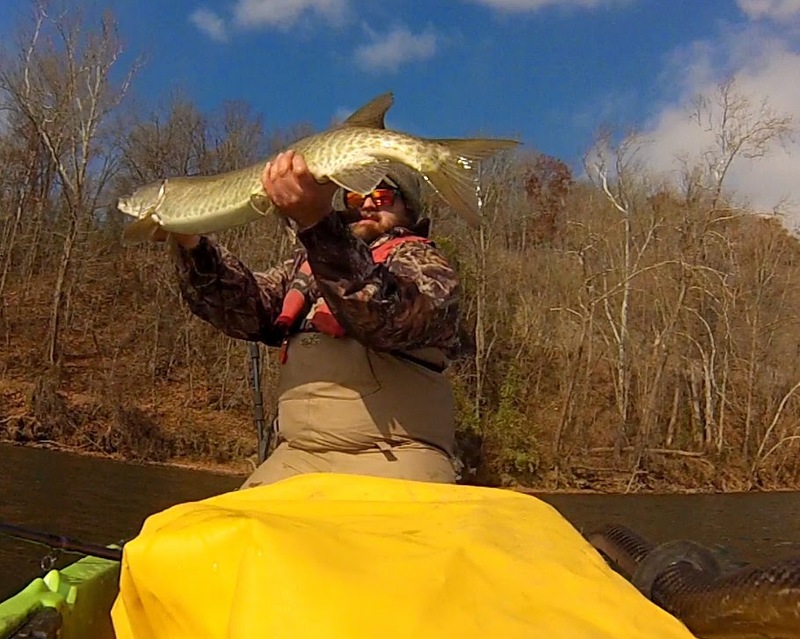 We were just missing our grand spectacle, a trophy quality New River beast. 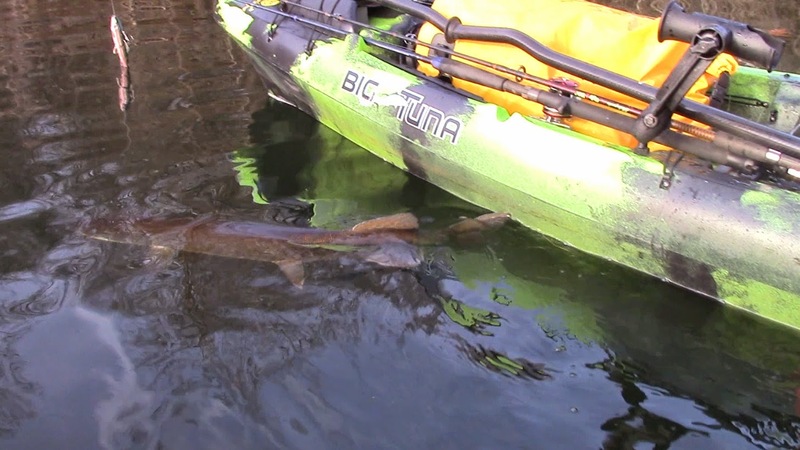 A video on Muskie isn’t complete without one, even if you are filming from a kayak. We got a few glimpses of some hefty fish soon enough, just couldn’t get any of them to commit. The sand was running out of our hour glass and it was beginning to look like we would go home with just three fish…. almost. 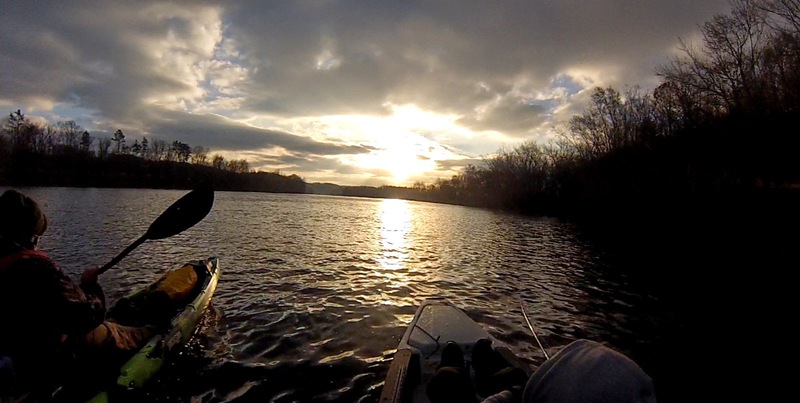 Zero hour was approaching and I got a promising tug from my live bait rod deep underneath the kayak. 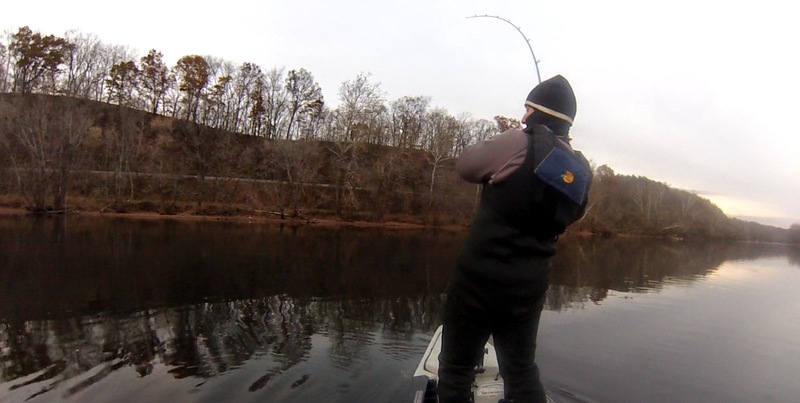 Grant got the camera fired up and I ambushed the ambusher with a stiff hook set. 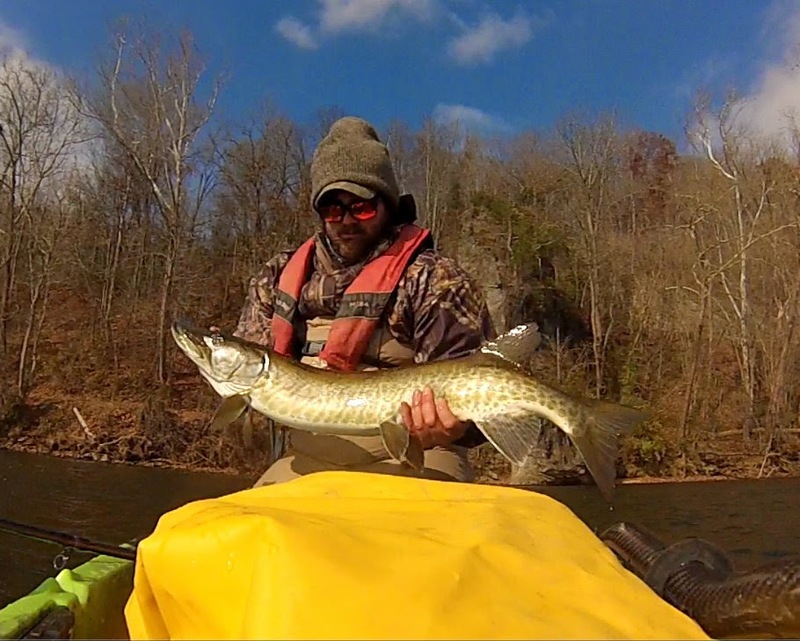 I could feel the enormous weight of the fish and both Grant and I simultaneously had the same thought, “there’s no way this is a Muskie”…. 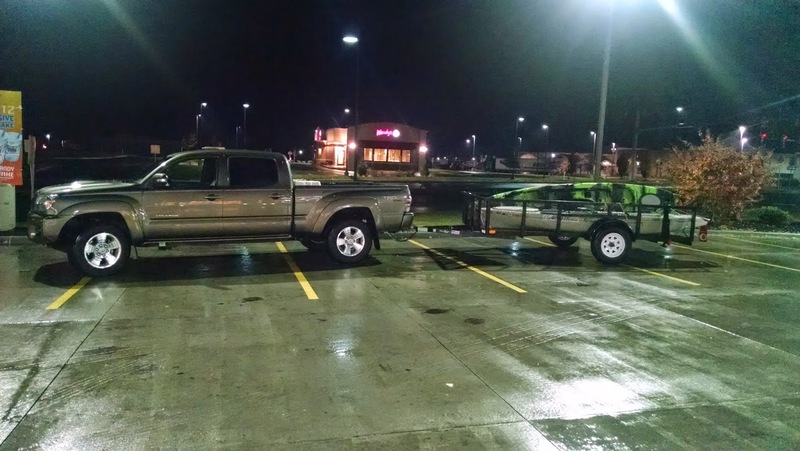 It’s just too heavy. 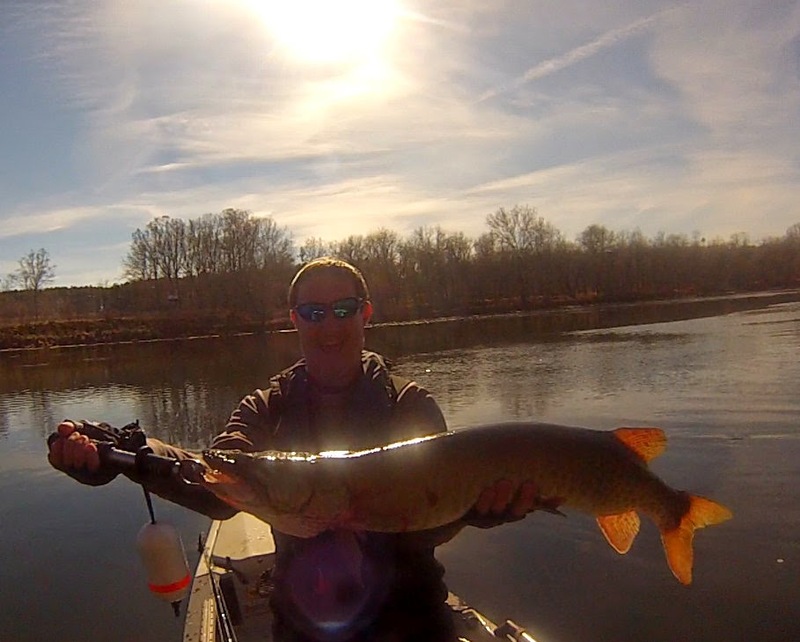 Well that thought quickly flew by as I got a glimpse of the beast that lay before me, a Muskie I can only describe as an upper 40s fish, around 48 inches I’d say. There was only one problem; my treble was in the very tip of the fish’s snout. After a few defiant, drag ripping dives the fish came straight at me, and with one powerful headshake she threw my only connection between a good memory and a nightmare I’m not sure that I’ll ever forget. After crying about it for about an hour we turned tail and headed for the ramp, soaking wet and broken. Although the rain darkened the skies, it wasn’t completely dark yet… that being said, neither of us are ones to quit so we continued to fish our way back. Wouldn’t you know it we both hooked up within minutes of one another, mine on live bait and Grant’s on the same style swimbait I had success with. As the sun faded we couldn’t help but feel pleased, yet, unfulfilled. Although landing five average size Muskie is nothing to shake a stick at, we could help but feel disappointed in what we left on the table. Five may be good, but seven with a monster kicker is better! All in all it was a great trip to the New. 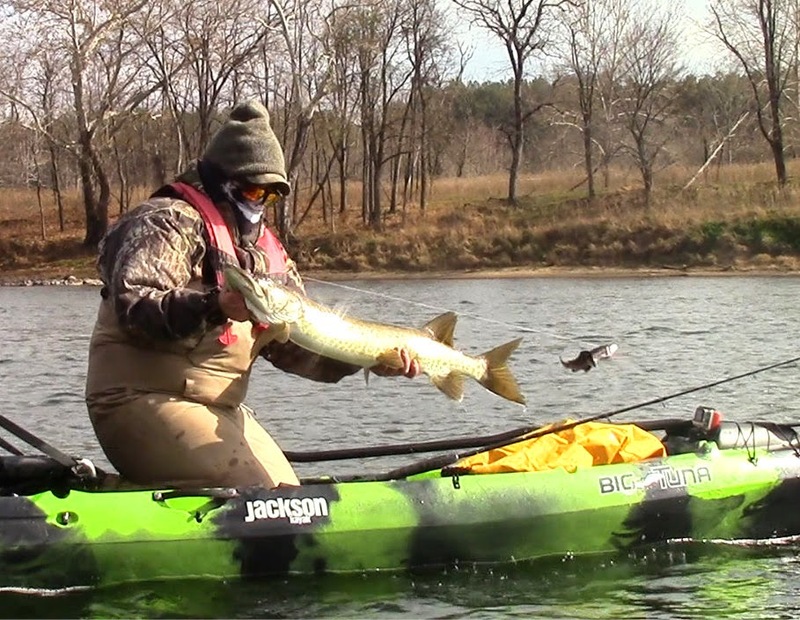 We got a few good fish on camera for our new series and that’s more than what we truly expected. The New is always a memorable and fun time… although I can’t help but think we’ll be back soon to restore our sanity. That’s part of the game we play and sometimes you just have to pay the Pied Piper. 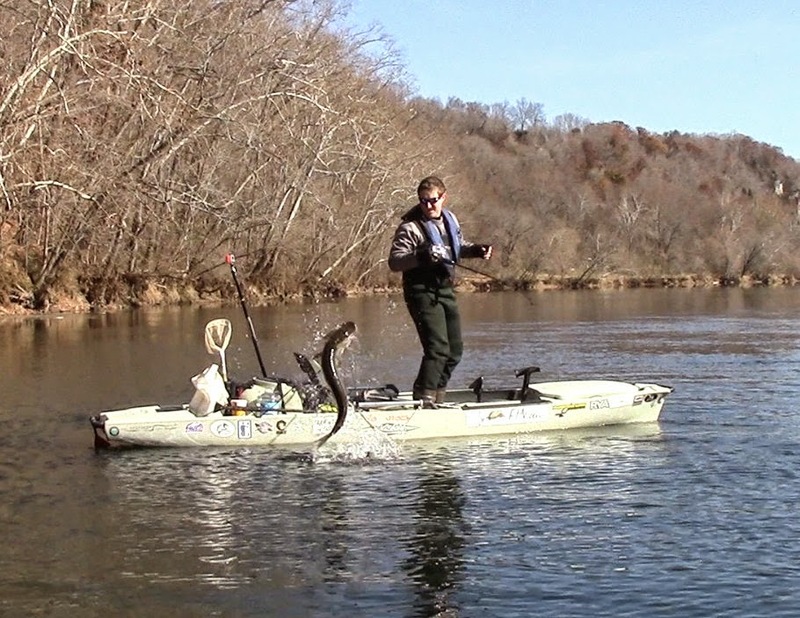 Although its not enough content for a full report, Grant and I both made separate runs up to the mountains for Trout. I went up first with my good buddy Wayne Tu from Yakattack to chase some healthy stocked Rainbow Trout. It was my first time casting a fly rod at live fish and I managed to score with a nice little chunk Rainbow. Grant ran a little more remote the day following and managed to get on some absolutely beautiful native Brook Trout. Native Brookies are becoming harder and harder to find these day with the effects that man and Mother Nature have on their environments. That being said, catching these stunning wild trout is something that is held in high regard not only in Virginia but across the country as well! Sweet fish and nice write ups! I look forward to your next adventure. Thanks you very much! We appreciate the feedback! Fish Hard or Stay Home "The Lifestyle"